This is a general purpose batch distillation unit to be operated at atmospheric Pressure. Heating bath heats and evaporates the contents of the vessel. 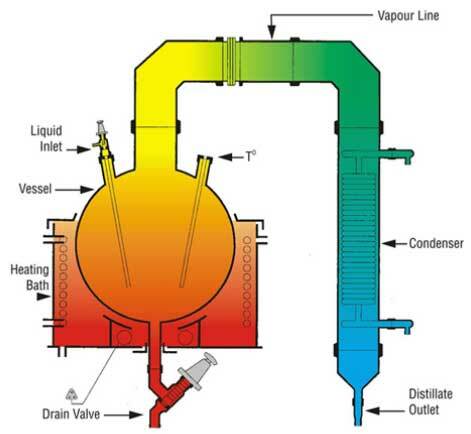 The vapors are then condensed in the condenser and collected in a container or a receiver. The unit is complete with a spherical vessel, drain valve, heating bath, thermometer pocket, liquid inlet, vapor pipeline and coil condenser. A receiver with drain valve can be added optionally. The unit is available in vessel size 20, 50, 100, 200 , 300 & 500 Ltr.